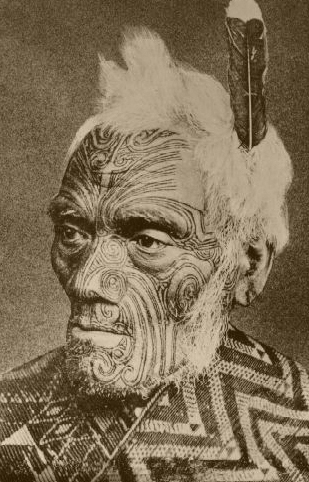 Ladies & gentlemen, I hope you had a great time for our first week with the maori people of New Zealand and that you did not get too scared with their virile way of welcoming. 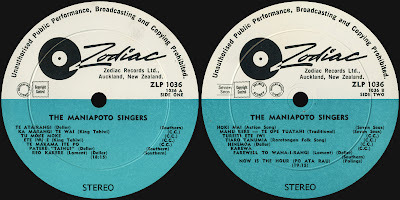 This week we'll go for something totally different with the SONGS OF THE MAORI, THE MANIAPOTO VOICES (Zodiac ZLP 1036 from 1966). Imagine what would have happen if the Andrews sisters where born in a Maori village In New Zealand... I'm pretty sure they would have become singers! Well, that's pretty much the same story for the Hikuroa sisters. 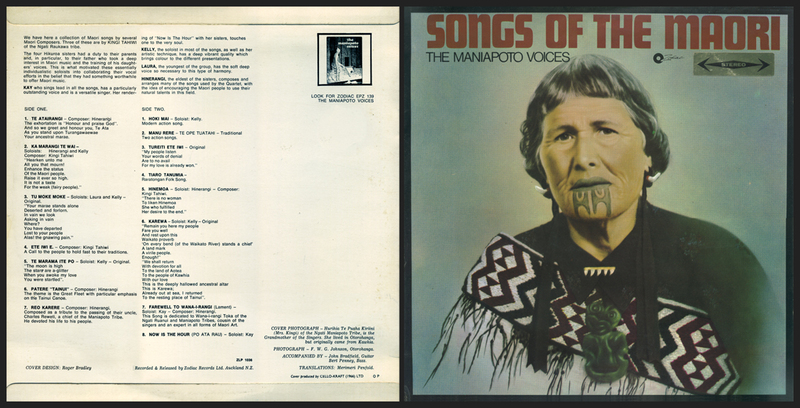 Kay, Kelly, Laura and Hinerangi are four Maori sisters from the Ngati Maniapoto tribe who kept the family traditions of singing and recorded this very sweet lp. Today, we got 15 gorgeous bittersweet folk songs with mostly vocals, some light strings and a hint of piano to enhance their goodness. 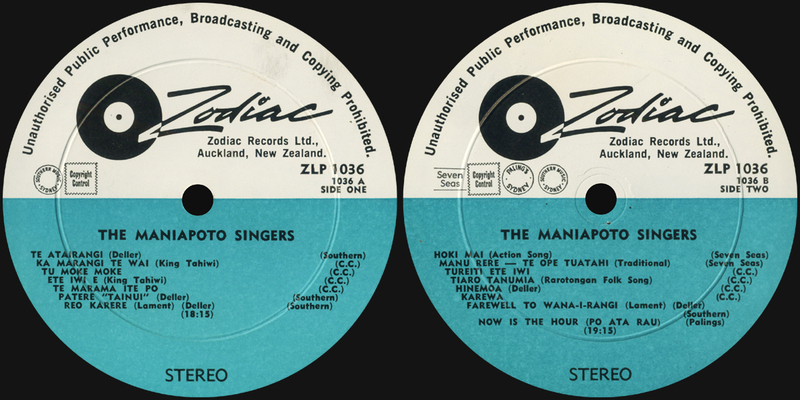 It seems like the sisters ever released some more songs as the back cover mention another Zodiac ep: THE MANIAPOTO VOICES, EPZ 139 that I'd love to ear. If you got more from them, please let me know! 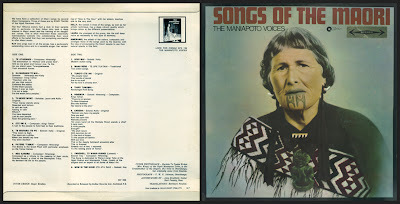 Not only those four sisters did their best to produce a gorgeous record but they been really great about the cover as they choosed a photo of their grand mother proudly wearing the traditionnal moko tattoo to illustrate their music. What a great way to show respect to their traditions and cultural background. ENJOY! Hello again kadao ton kao! Had lots of computer problems and got a better one. Vista now. Thanks for the great tunes from NZ! Glad you stopped there. 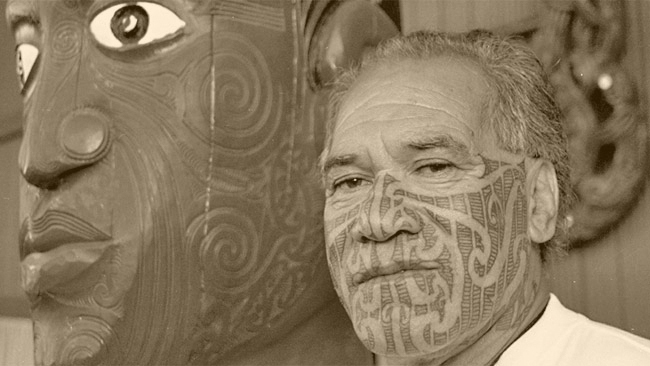 Songs of the Maori is great stuff. The voices of the girls have nice harmony, and it screams Tahiti. If you want to check out more tunes I'm back up on SLSK, but had to redownload and don't have your user name. I was sure you'd be pleased by this one Steve. The sisters did a real sweet job. later this year, i'll post some other polynesian sisters Lp that I like a lot too! I just want to say again that this is a really good one. Very beautiful indeed. You have an amazing blog. thanks a lot steeve, It's always good to see locals keeping their culture an traditions alive, seems like you guys have good time at stebbing recording!